After clicking 'Yes' the next screen appears. Tip: It is important to define the payment periods before entering the registration types. If you define the registration types first and then the payment periods, the registration types wll be deleted. Click on Edit Period to start with the payment periods. The screen shown above is displayed when you click the ‘Edit Period’ button below the ‘Registration types/Fees’. ‘Payment Periods’ is a drop down menu in which the number of payment periods can be defined, with a minimum of 0 and a maximum of 3. If you choose 0, then your conference will be free. Click on New to start with the registration types. Using the ‘Edit’ and ‘New’ buttons (see above screenshot), you can define new registration types or modify existing registration types. Clicking one of the buttons causes the screen shown above to appear under the registration type and next to the payment periods. The ‘Registration Id’ is the sequence number given to a registration type. You can define the number yourself. ‘Registration Type’ indicates the registration type. The number of registration definitions is dependent on the number of payment periods selected. Enter the fees that apply to ‘Fee Period 1’ and ‘Fee Period 2’ for the first period and second period, respectively. By using the drop down menu ‘VAT (%)’ you can define the V.A.T. percentage that needs to be levied on these registrations. The choice of none, low or high VAT can be made, as shown on the ‘form’ ‘V.A.T. Data’. 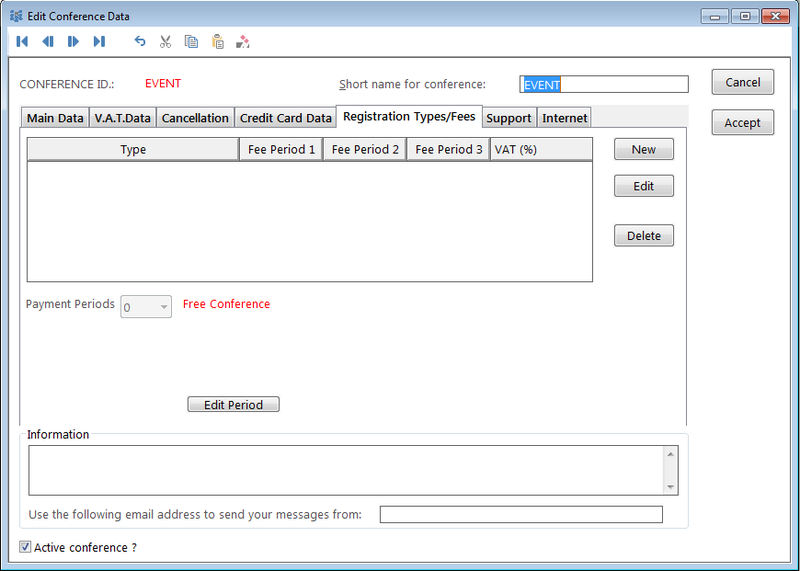 With the checkbox 'PA-event' you can indicate if an event is especially for accompanying persons. When the participant chooses such an event on the internet, he cannot finish the registration without filling in an accompanying person. If the participant doesn’t choose a PA-event, he cannot add an accompanying person. You can adapt the number of accompanying persons which the participant can register. For example if the participant chooses 3 accompanying persons, he cannot finish his registration without adding 3 accompanying persons. This check is only on the internet, not in Eventure.